In December, the first sign of approaching Christmas at our house, well before the wreath goes up on the front door, is the steady buildup of holiday cookie tins. 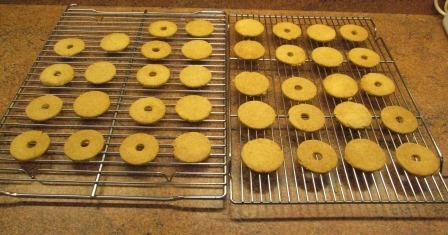 I start my cookie baking early, making two indispensables (Toll House and peanut butter), a selection of other favorites, and usually at least one new or uncommon variety. This year I added kourambiedes, reginas, and – for the uncommon one – Ischler törtchen. 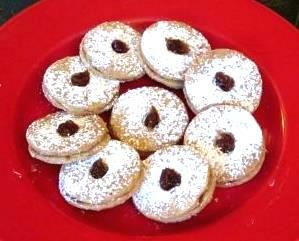 These delectable tartlets look like miniature Linzer tortes. 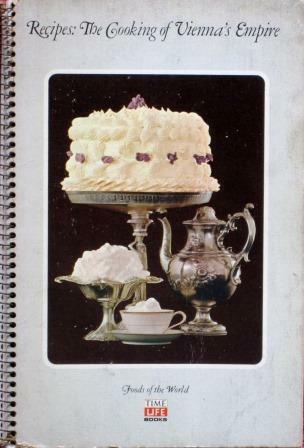 I used to make them many years ago, from a recipe in The Cooking of Vienna’s Empire volume of the Time Life Foods of the World series. But they’d slipped out of my repertoire. Time to reinstate them! Cream butter and sugar; add ground almonds, flour, and cinnamon; mix until a dough forms. Bake in a moderate oven until lightly browned. Spread each solid round with jam (traditionally raspberry, but I had some black fig jam from Sicily that I wanted to try) and top it with one of the pierced rounds. Line them up so confectioner’s sugar can be shaked generously over them. Delectable they certainly were. The black fig jam was fine, though I have to say the classic raspberry filling is indeed the ideal flavor match for the almonds. These tartlets don’t keep as well as my regular Christmas cookie varieties, so we’ll have to eat them fairly quickly. Not a hardship! 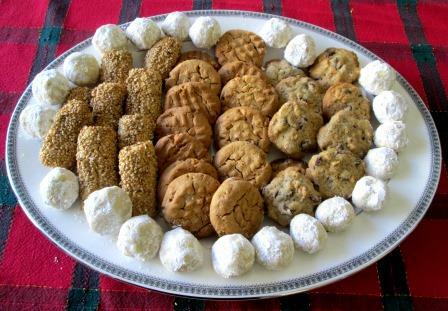 Of course, neither do we want to ignore those other Christmas cookies, all so very good in their own ways. Santa always seems to like them too. Merry Christmas to all, and to all a good bite! It’s hard to find good commercial kaiser rolls. Those I remember from my childhood – Sunday-morning treats from the neighborhood German bakery – had crisp, hard crusts and a nice, not-quite-fermented flavor. 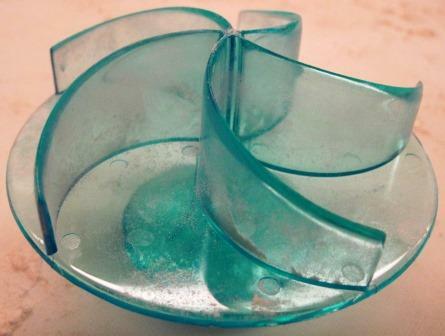 I also remember wonderful crullers, jelly doughnuts, and pebbly, sugar-powdered coffee cakes. Sigh. Now you can’t find a cruller anywhere, and what they call kaiser rolls and sell in every grocery store are soft, flabby things that might as well be made from Wonder bread dough. I wouldn’t be surprised if they were. So of course I had to try making my own. 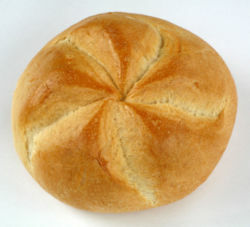 Now, specialty breads like kaiser rolls really need the techniques of professional bakeries, as well as ingredients that aren’t typically found in the home pantry: malted grain and the natural leavening ingredient called barm, according to Wikipedia. So at best a home recipe could be only an approximation. 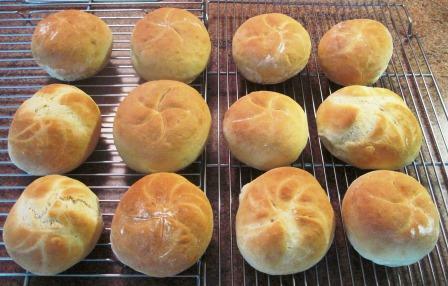 Probably for that reason, none of my many cookbooks has a recipe for kaiser rolls, and most of the ones I found on the Web looked as if they’d produce totally ordinary bread rolls. But I did find one that was a bit different, and I’ve used it several times. It hasn’t resurrected the Kaiser rolls of my youth, but it’s not bad at all. What this recipe adds to the typical bread roll preparation is egg whites: three stiffly beaten whites folded into a short pre-ferment of yeast, water, salt, sugar, shortening, and flour. Frankly, I don’t see why the whites need to be beaten, since once they’re in you have to add more flour to make a proper dough and knead it thoroughly – which I’d think would push out most of the air from the whites. Maybe it just keeps them from being slimy in the developing dough. But it does give a distinctive flavor to the rolls, which I like. Fold left side to center to form a flap. Halfway down flap fold again to center to form another flap. Repeat all the way around to make overlapping flaps. Lift the first flap to ease the last flap underneath. Press center to seal the dough. Sounds okay, doesn’t it? But somehow my folds always produced lopsided shapes, and in the oven the folds often lifted up into useless points. I finally gave up and bought one of the pinwheel stamps. 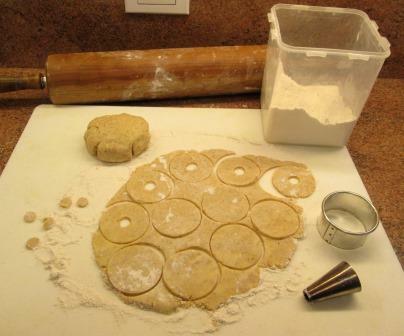 It comes with directions, saying to press all the way down into the rounded dough but not through to the pan surface, or the roll may fall apart. In the photo below you’ll see I thought some of my initial pressings were too gentle, and in doing them again I couldn’t quite get the stamp over the exact same spot on the dough. Once they’re stamped, you turn them onto their faces to rise, uncovered, for half an hour (that’s to help them keep their shape) and then turn them back upright for 15 minutes before baking. They tolerate this treatment surprisingly well! A bit disappointingly, most of my pinwheel cuts didn’t open up in the baking as they should. Next time I’ll wiggle the stamp around a bit when it’s down in the dough. They could probably also have taken a little more time in the oven, to get the crusts really hard. Still, they’re a very tasty roll that makes a good sandwich. And I can always stick one back in the oven for a few minutes to firm the crust just before using. They freeze well too. A historical note, for those who like to know where foods come from: Apparently, Kaiser rolls originated in Vienna, which is no bad beginning for baked goods, and migrated west, north, and south. The western branch found its way to these United States by way of still-lamented neighborhood German bakeries. The southern branch travelled to Milan when the Lombardy region was under Austrian rule, where they became rosette, excellent hollow breakfast rolls that I’ve found only in Rome, where they’re the staple of every hotel’s breakfast buffet. Rosette are also nearly impossible to make properly at home: I’ve tried! A strong family resemblance there. 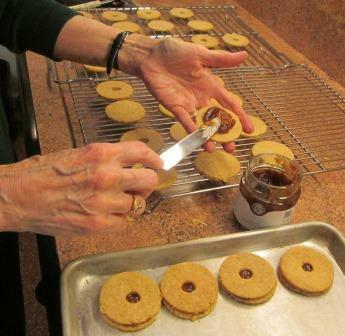 Every December, I make many kinds of the same much-loved Christmas cookies: ginger snaps, ruggelach, kourambiedes, Toll House, peanut butter, walnut crescents…. it’s glorious holiday excess, but by mid-January Tom and I are fairly sated with cookies. 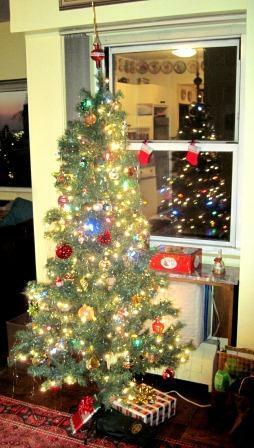 This year I vowed more restraint: only two of the traditionals, plus one new kind, as much for novelty as for this blog. 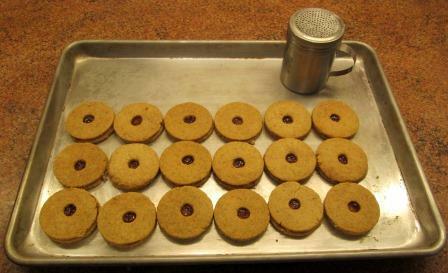 After lengthy research, I chose a new recipe from the Cookies and Crackers volume of the Time-Life Good Cook series: Linzer Nussgebäck, or Linz Nut Cookies from Germany. 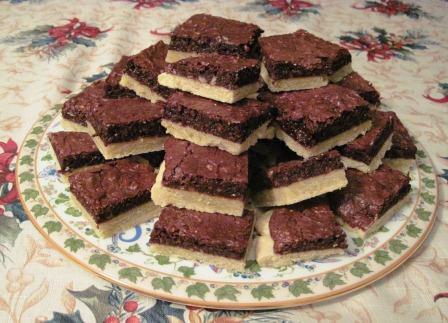 The technique is to make a pastry base, partially bake it, spread it with a layer of chocolate-nut cream, bake again until the topping is firm, and cut it into squares or bars. It sounded delicious. This was, however, the most worrisome cookie recipe I’ve ever attempted. At no point in the very long procedure was I at all confident that anything edible would result. Start with the pastry base. 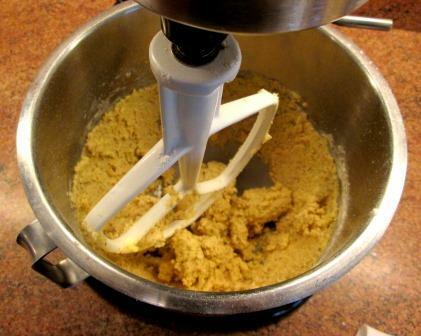 In my Kitchen-Aid mixer I put flour and sugar, worked in butter, and added 5 egg yolks – the only liquid. This was supposed to turn into dough and be kneaded well. (That was weird. You never knead pastry; too much handling makes it tough.) My mixture refused to come together. It remained sticky crumbs, even when I tried to compress it by hand. I had to add 5 tablespoons of water before the dough grudgingly formed. 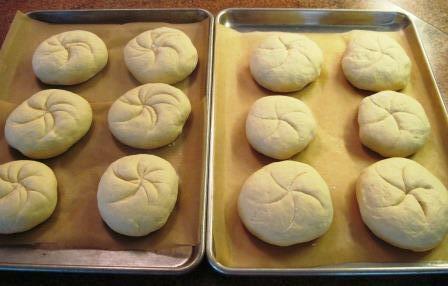 The next step was to roll the dough to a thickness of ¼ inch. It kept trying to break apart under the rolling pin, and I had to virtually mold it by hand like clay. By the time it was thin enough, it was about 12 inches square, which I was sure would fall to bits if I tried to transfer it to a baking sheet. I cut it in two pieces and persuaded them onto separate cookie sheets. While they had their first baking, I prepared the topping. I blanched, peeled, and ground 7 ounces of almonds; ground 8 ounces of semisweet chocolate (a very messy task! ), mixed these with the 5 egg whites and a cup of sugar. It was all to be stirred over low heat until it became “thick and creamy.” Well, it was thick to begin with, and the chocolate and sugar melted all right, but with all those gritty ground almonds the mixture wasn’t what I’d call creamy. When I subsequently spread it on the pastry base and saw how thickly the soft topping lay, I feared I’d made a terrible mistake by using flat baking sheets instead of pans with a rim. I could visualize the chocolate liquefying, running over the edges of the pastry, spreading out over the sheets, and dripping onto the floor of the oven. But it was too late to change, so I slid the sheets into the oven and prayed to the pastry gods and the spirit of Christmas Present. Not bad looking, are they? But how do they taste? Well, I have to say I was underwhelmed. The thick pastry base was bland, without the richness you’d expect from all the butter, sugar, and egg yolks it contained. The equally thick nut-chocolate topping was rich and fudgy – a great wallop of sweetness – but the two parts of the cookie didn’t do much for each other. They just sat there separately in the mouth. When Tom tasted one, he said it was like commercially made cake: something you’d find on a grocery store shelf wrapped in cellophane. Now, this was only two people’s opinion. We aren’t great sweet eaters in any case. I had some contrary evidence the next day, when I brought a batch of them to a Solstice Cookie Exchange, a holiday event for Morgan Library staff and volunteers. There was an abundance of homemade treats on offer, and an abundance of enthusiastic nibblers. Within an hour my nut bars were all gone. Some folks must’ve liked them!